The last big update to CA's Total War: WARHAMMER was the addition of the Beastman race this past summer. I enjoyed the opportunity to play a race that was a part of my tabletop experience in my youth, but I was just waiting for the real pièce de résistance: the Wood Elves. 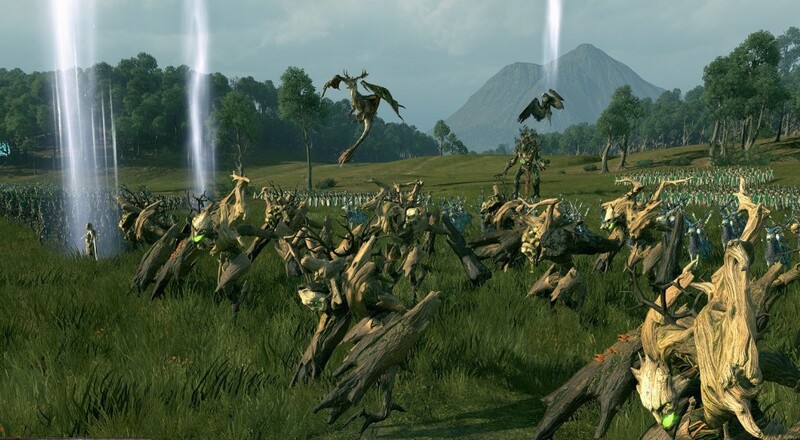 Just as with the Beastman expansion, the Wood Elves DLC will not inlcude a whole new race to play (with new units and new mechanics), but also a new mini-campaign that features the race outside of the main Grand Campaign mode. The Wood Elves will be lead by two new legendary lords (the demigod Orion and the Treeman Durthu) and offer a different kind of victory condition: restoring the Oak of Ages. You can check out the store page for the DLC for more details, but this race will be quite different from those we've seen so far in the game. The "Realm of the Wood Elves" DLC will be available on December 8, and is currently available at a 10% pre-order discount. Total War: WARHAMMER supports two player online co-op within the Grand Campaign mode. Page created in 0.5753 seconds.